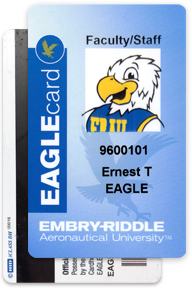 Your EAGLEcard will identify you as an affiliate of the University - whether as a student, visitor, contractor or faculty/staff member. The I.D. is required to be presented whenever you attend any school activity, event, game or department for services. If you reside in on-campus University housing, your EAGLEcard will provide you access to the residence halls. Also, certain labs and buildings require the use of an EAGLEcard for entry. See the Make a Deposit section to add funds to this universal account.